Okay, folks - just clearing out my drafts file. You now have every post in this series I'd prepared before I pulled the plug on regular posting on this blog. 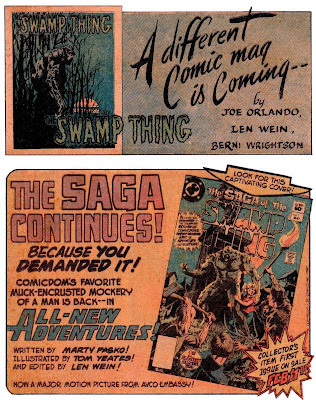 Maybe one day I'll get around to compiling and publishing the rest of the cover comparisons. If so, you'll be the first to know - promise. 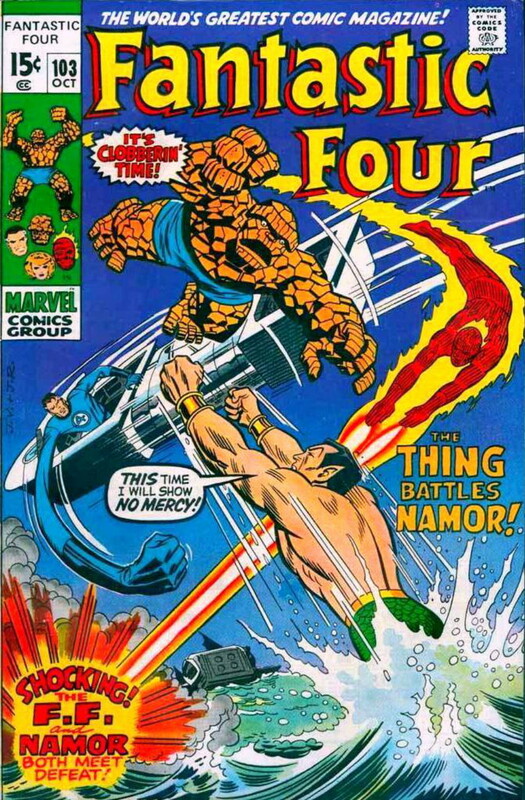 You all know the drill by now - two covers for the same story, one based on the other, but different artists on each, several years apart. Got a preference? You know where the comments section is, frantic ones - don't neglect it. Cop a gander at the image above. 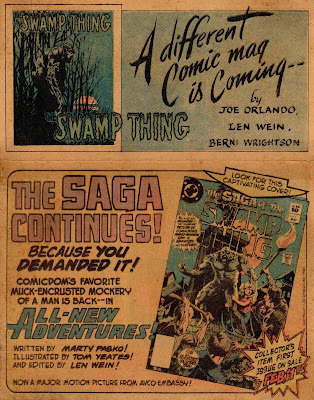 Back in 1982/'83, I must've had spare issues of a couple of DC comics, one from the early '70s, the other from the early '80s, because I cut an ad for the first series of the SWAMP THING from one and glued it onto a piece of card above an ad for The SAGA Of The SWAMP THING I'd cut from the other. Alas, memory no longer recalls exactly what comics I desecrated in the process of combining the old with the new. 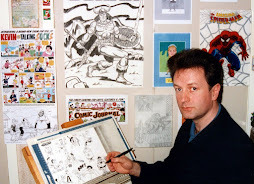 The plan was to put the homemade pin-up on my bedroom wall with all the other cut-outs and posters that adorned it, but I can no longer recollect whether I actually managed to get around to it before moving house in May of '83. I'll have to dig out my album of photos of my old (and current) room and check to see if it's on one of the walls. Whether it was or not (just checked - no sign of it), it was certainly given a spot in my new bedroom once it had been decorated, though I had to wait a year for the new-built house to settle before I could get around to it. Anyway, when we flitted back to our previous house four years after having vacated it, the pin-up was again awarded the accolade of enhancing the decor, and has done so for the past 30 years. 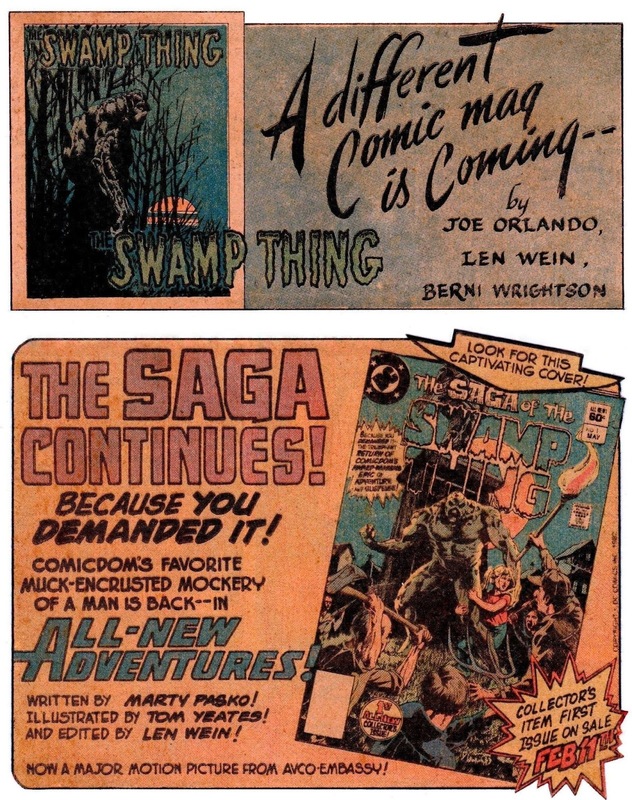 Until recently that is, as, like many other of my posters and pin-ups, it had discoloured with the passage of time and was in dire need of replacing. So that's precisely what I did. I carefully removed it from the wall, trimmed off the margins and gutter, then scanned it against a white background and printed out a duplicate. With one difference (as you can see if you compare the above pic with the one below) - namely, I reduced the space between the top ad and the one below it just a tad, as I thought it looked better. Anyway, the image survives, and continues to grace the same spot on the wall where it's been for the last 30 years. This time though, it doesn't look quite so time-worn as it had become a good while back, leaving me to wonder if there's anything that can be done to replicate the effect on me. Oops! 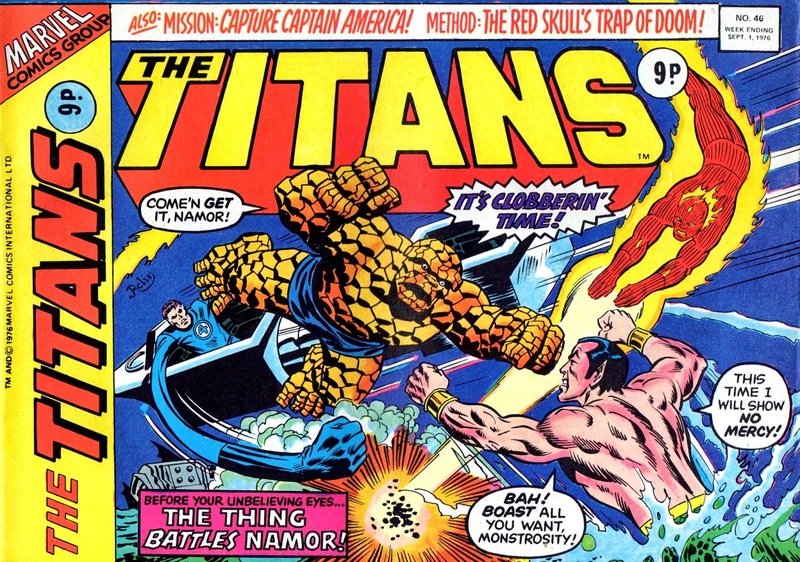 I've had a couple of these FF/TITANS posts sitting in my drafts file from before I discontinued the blog on a regular basis. Was looking at them earlier and unintentionally hit the publish button instead of the close button on the second post without realising it. Just this moment noticed, so I've returned part 12 to my draft file and decided to publish part 11 just in case you're wondering what the heck is going on. 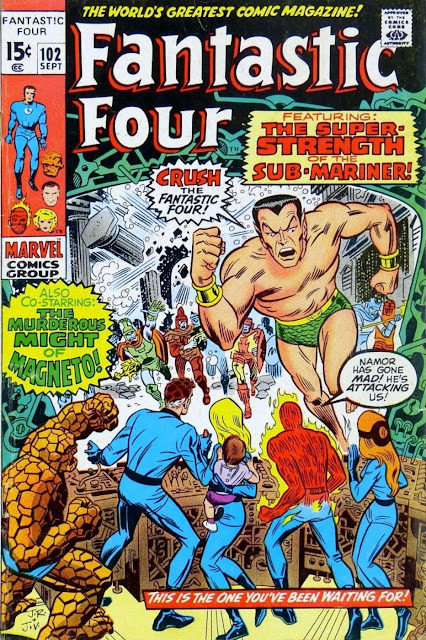 JACK KIRBY's final issue of The FANTASTIC FOUR, sporting a cover by JOHN ROMITA and JOHN VERPOORTEN, and its near doppelganger, The TITANS #45, by - who? Anyone know for sure? 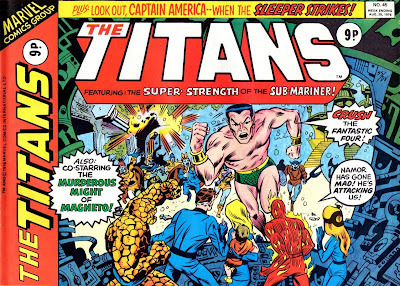 The penciller's initials are SS so could be by STEVE STILES, and the inker is likely DUFFY VOHLAND. There, I've suggested an answer to the question myself, but feel free to chip in your two cents worth, true believers. I find myself with a few spare moments, so even though the blog is officially 'retired', I thought I'd dash off a quick post for anyone who might still be feeling deprived over the absence of any regular posting on Crivens! What follows is the result - hope it doesn't prove a disappointment for you. Well, "Yes" and "No" is my response to the exasperated question I imagine some of you may be asking. Yes, it is a post about me renewing and replacing a 'poster' on my wall, and no, it isn't just that. Intrigued? Then read on, MacDuff. 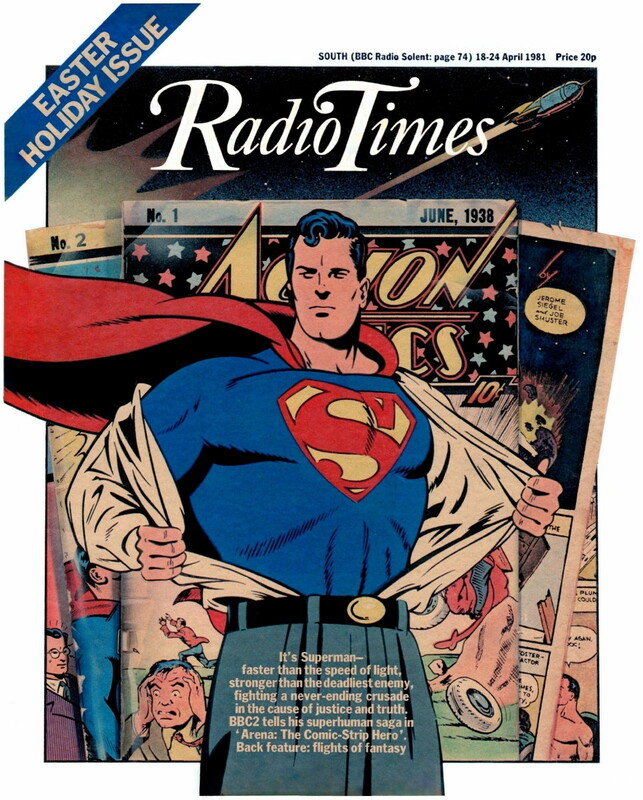 I obtained the above issue of the RADIO TIMES in Southsea or Portsmouth back in April of 1981, around three weeks before returning home and eventually putting the cover up on one of my bedroom walls. (I still have the 3 page SUPERMAN article from inside.) There it stayed for two years before we moved house, whereupon it took up residence on the wall of my new room, where it stayed for the final three years out of four. (I had to wait a year for the house to settle before decorating, as it had just been newly built.) 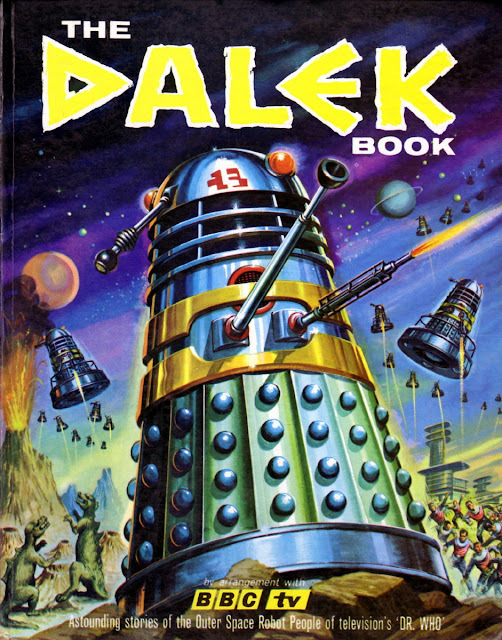 Then, as any regular readers will be tired of reading, we moved back to our former home, and the image resumed it's previous place on the wall, where it's been for around 30 years. I'm sure you're all aware of just what 30 years can do to a piece of paper, and sure enough, the page had become tanned and perhaps just a tiny tad faded. Also, when I'd first stuck it up on the wall, I used so-called 'invisible' tape, which despite claims to the contrary, can brown and shrink over time - and it had! (Originally, I'd carefully and neatly taped it all the way around the edges, half on the page, half on the wall, but latterly, it was held in place by small pieces of double-sided tape on the back.) So, recently, I took down the image, carefully cut away the margins of the page, replaced the line of print on the top right-hand corner with an enhanced copy of the original (the surrounding area whitened, the words darkened), scanned it against a white background, then printed out a superior copy the same size as the 'master copy'. I also took the opportunity to digitally remove any noticeable wrinkles and scuffs, though I didn't bother with minor imperfections. So a nice new replica now adorns that same space on the wall, but I haven't yet disposed of the original. I find it hard to casually cast off something that I've had for 37 years, more than half my life away. I'll maybe paste it onto a piece of card and put it with the few internal pages that I yet possess, but that's a decision for another time. Anyway, the other topic I wanted to mention is just how amazed I am that, after staying in Southsea for around 3 or 4 months, when I returned home, I fitted right back into my old life as though I'd never been away and never really missed Southsea or Portsmouth. Looking back, it seemed that I instantly forgot about my time there, but I now realise that's not quite true. It was still all so recent and fresh in my mind that I simply didn't feel far enough removed from it for me to miss the place. That takes time of course, but I still remember my first day back home and how easily and effortlessly I resumed my old routine. I ran into someone I knew on my first day back, and he said "I thought you were in Portsmouth?" "Just got back this morning!" I said as we passed one another, but he looked as if he didn't quite believe me, and it occurred to me to wonder if he thought I'd invented my intention to visit the place and had just been staying out of sight for a few months. You're probably wondering why I even mention the subject, but I'm astonished that I could live in another part of the country for that length of time, with different neighbours, different accents, different shopping centres, different experiences, different points of reference, different local newspaper, etc., - and then remove myself from it all, seemingly without even a backward glance or feeling of regret or displacement. (And I really enjoyed my time there.) As I said though, it was all still so recent to me that it never occurred to me to miss it. Perhaps, subconsciously, part of me was still there, which would help explain the ease with which I returned to my old routine.